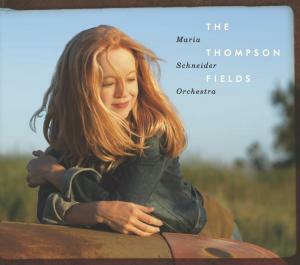 You don’t listen to CDs from the Maria Schneider. You “experience” them. Much like the orchestral jazz of Bob Brookmeyer, it is hard to categorize Maria’s intense, sublime compositions. A close enough description is that they are a hybrid bridging classical, world folk, and jazz. Their beauty to me combines Aaron Copland’s classical Americana with the best of big band jazz. The theme of The Thompson Fields is her love and appreciation for her childhood home in rural southwest Minnesota. Inspired by the landscape and the flora and fauna of the area, Maria composed the eight tracks on this CD. An added bonus to the exquisite music is the 70 page book that holds the CD. There are gorgeous photographs of the farm area, as well as Audubon paintings of the native birds. Maria gives extensive descriptions of each track and her inspiration for the music within. The opening track, “Walking by Flashlight” features an achingly beautiful alto clarinet solo by Scott Robinson. The composition was inspired by poet, Ted Kooser’s “Winter Morning Walks.?? Frank Kimbrough’s piano blends with clarinet to transform the listener to a reverie that takes you to a prairie field with a soft wind blowing the reeds. “The Monarch and the Milkweed” is dedicated to the monarch butterfly’s attraction to the native milkweed plant as a place to lay her eggs. Marshall Gilkes and Greg Gisbert solo on trombone and Flugelhorn, and their burnished brass increases in intensity as the track progresses spurred on by Clarence Penn’s drumming. Maria’s love for birds takes us temporarily out of the heartland to New Guinea where the live rituals of the birds-of-paradise bring fascination on “Arbiters of Evolution.” The full orchestra’s powers are harnessed here. Donny McCaslin on tenor and Scott Robinson, now on tenor, take lead. We’re in full jazz mode here. The title track follows and guitarist Lage Lund opens with a guitar solo that calms and inspires. It brought to mind for me the mood that Pat Metheny and Charlie Haden elicit on their duo work, but here supported by woodwinds and brass, and the piano (of Frank Kimbrough). The concept of “home” is explored on a composition with the same name. Maria honors the jazz impresario, George Wein, whose Newport Jazz Festival is one of the longest tenured jazz festivals in the world. Maria had the premiere of “Home” debuted at Newport. Rich Perry’s tenor sax solo is striking, and sets a mood that combines both melancholy and joy. “Nimbus” has as its inspiration the Midwestern landscape that can be bleak and drab, but capable of dramatic weather changes that elicit awe. Steve Wilson on alto sax, digs in and blows with an intensity of an F2 tornado. “A Potter’s Song” is dedicated to trumpeter, Laurie Frink, a long term member of the orchestra, who passed away from cancer in 2013. In addition to her trumpet skills, Schneider also greatly admired her skills as a potter. Gary Versace, who has brought the accordion front and center back into jazz as a lead instrument, adds a “gypsy” quality to the track before Keith O’Quinn on trombone makes a tender entrance. Versace returns and takes the melody out.